In my unusual circumstances of having been a sewer and then not being one for many, many years, I wasn't very familiar with the name of Nancy Zieman, nor aware of her importance to the world of sewing. In recent years, I've noticed items from her line of notions by Clover, but don't own any of them. For some reason, I had her pegged as a "quilting person" and — begging the forgiveness of every quilter out there — since that didn't define my interest, I didn't pay much more attention... until I heard that she'd passed away last November. I'm not going to go into her story, because if you don't know and are curious, you can easily look it up for yourself. Suffice to say that she was an inspiring person, in many ways a role model, and ultimately had a life of creativity cut too short. During my YouTube watching back in late February (the same time I came across the video for the 5 pocket zippered pouch), I found this tutorial from Nancy's Notions and immediately downloaded the corresponding PDF. It was my intention to make it with some of the new fabric that I'd recently ordered. While weeding out files from my Other People's Projects folder recently, I made it a point to print out the templates so that it wouldn't slip my mind that this would be next on my to do list — after the Sew4Home quilted accordion pouch — as a tribute to Nancy and her legacy. 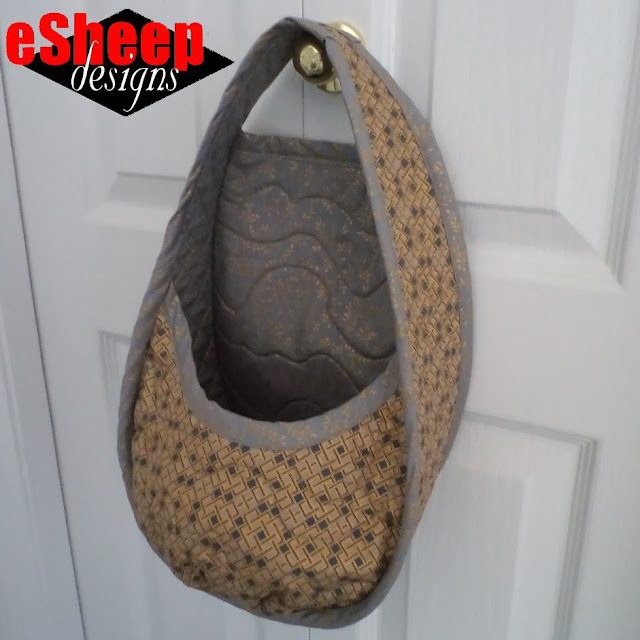 This is the Best Nest Organizer Basket, a free pattern and tutorial to make a quilted hanging basket (links provided at the end of this post). 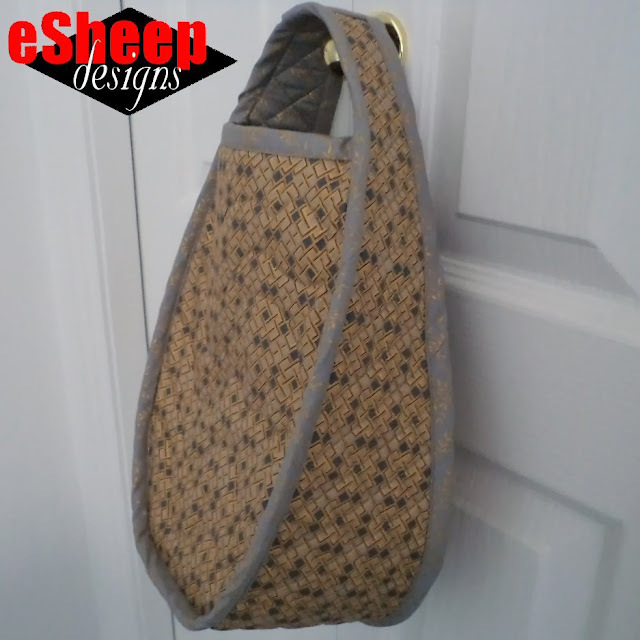 Its big "pouchy" design makes it ideal for storing a multitude of things. The pattern itself seems not to be widely circulated (it's hidden away on their site for some reason), so it's also one of those wonderful surprise freebies. While you've likely seen your share of fabric baskets, this one is sufficiently different that it might just tempt you to give it a try, even if just to sharpen up some sewing skills. 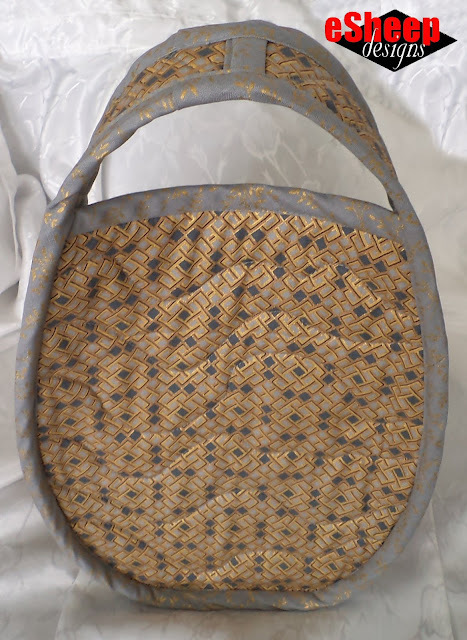 In my case, I made my own bias binding (for the first time, using an awesome technique of sewing two seams and cutting one continuous strip from a square of fabric) and then also quilted all of the fabric for this basket. That said, consider using just every second occurrence of whatever element, because I found this to be very labour intensive, due to the size. With 2cm squares (less than 1"), it took a long time to quilt this relatively small piece. 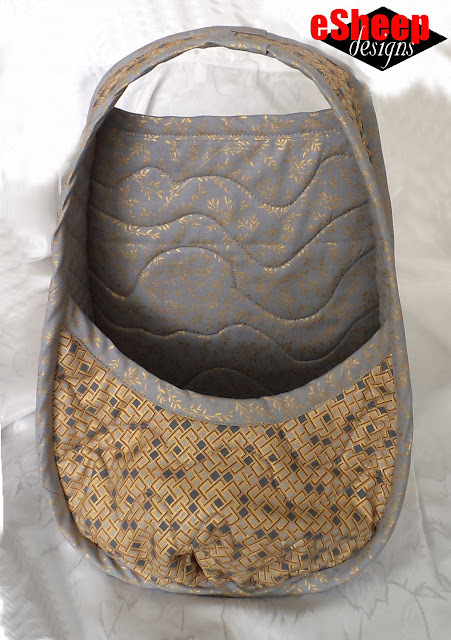 I didn't use the suggested layout in the PDF, having learned from the accordion pouch project that I don't like to quilt large swaths of fabric at a time. (There's more than a bit of waste with those recommended layouts, too. Look for an upcoming post in which I make something out of the remains of the quilt sandwich from the accordion pouch.) Instead, I quilted two smaller rectangular pieces and used the first one to cut the gusset pieces and then this other to cut the front and back panels. Got tired of doing the diamond quilting! My fabrics were Boundless DECOdent selections from an Earthtone Stash Builder pack, purchased earlier this year. The finished basket is large enough (standing 35cm or just shy of 14" tall, by 8" or 20cm wide, and about 5" or 13cm deep at the very bottom) that it has found a job as the storage place for whatever my current sewing project might be. Other suggestions: it'd be a great Easter basket option for holding a floral arrangement or the kiddies can actually go out egg hunting with it. 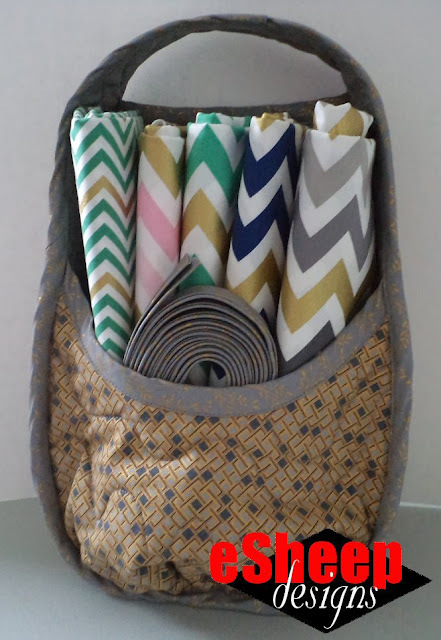 Or, it's a handy item to have in your guest bedroom to hold bath linens and related supplies. It would also make a nice house warming present. If you want to make this, let me say that the PDF consists of only two pages of instructions, so it's probably not a project for beginners. The video is similarly brief, running just under four minutes. However, with both available, someone who's up for a challenge can easily make this. There are only four pieces to the entire basket (three if you choose to cut the gusset/handle as one piece), so construction-wise, it's not a brain buster. My bias tape was cut from 2" strips; the PDF says to use 2.25" strips. The 2" width will do the job, so save yourself some fabric if you're making your own bias tape. The instructions also say to use a "generous" 1/4" seam allowance when first attaching the binding to the wrong side. I found that 3/8" (1cm) is actually the best measurement to go with; it's an exact measurement (neither generous nor stingy!) and when wrapped back around to the right side and stitched into place, the binding looks even on both sides. Maybe what they mean by a "generous" 1/4" seam allowance is 3/8", but then why not just say so and be clear about it? By the way, I basted the front and back pieces to the gusset by hand before starting the binding. The instructions merely say to baste the layers together, but I took one look at the bulk and the gathering at the front of the basket and decided to opt for hand basting. Overlap the binding at the end with a folded edge for a clean finish...sorry for the shadowy pics! Speaking of binding, make an effort to iron/steam the edges of the finished basket. That twisted appearance that you see on one side of the front binding disappeared after I gave it a steam. One final observation: no quilting instructions are provided. As I said earlier, I made my quilt sandwich with fleece as my batting and did not use either spray starch or spray basting. 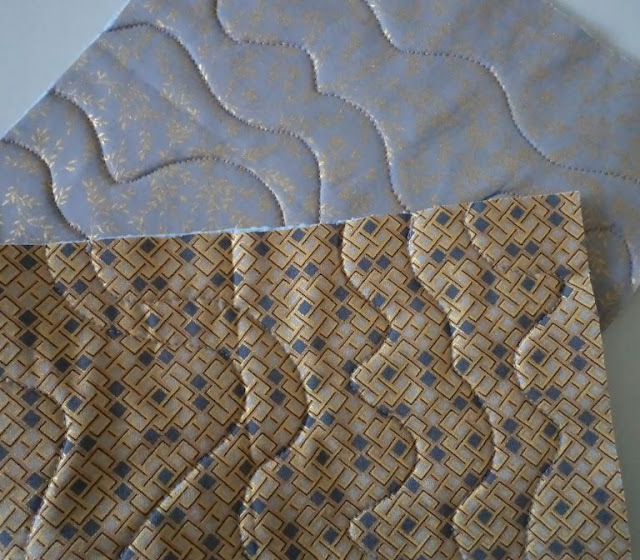 Yes, there was some shifting of layers despite judicious pinning, but that's why the pieces are cut after quilting. As an alternative, one might try simply interfacing both fabrics with fusible fleece. However you make this basket, here's to Nancy Z for the gift of the pattern and for her tremendous contributions to the world of sewing. Here are the links to the PDF and the YouTube video. Spread the word; this project is too nice to stay hidden. I watched Nancy for decades for sewing and quilting. I had not seen that basket pattern before. Nancy passed away the day after my birthday. She was an inspiration to so many. You can spend a lot of time watching all her old shows now, that will be all new to you and to all the younger people out there that were too young to know about her too. You did a great job for not being a quilter, lol! And thank you for dropping by and visiting! Like the knob-hanging aspect; thanks for sharing! Yes, it's quite handy that way. Thanks for stopping by! I knew about Nancy but always thought she was far "above my pay grade" as far as difficulty goes. 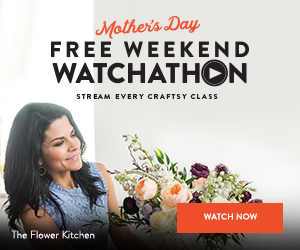 This really looks like a fun and useful project...and thanks to your advice, not as difficult as it might seem. Happy to hear that. (You go, girl!) My own decision stemmed from that same sort of thought: this isn't as hard as it seems. Worth the effort and you'll love the result. Thank you so much for sharing this. I had never seen it before either. Think I'll make some as gifts and a whole lot for my stuffed studio. Nanny made everything look easy. Thanks for the pattern. Amen! And thanks for stopping by. I've never seen a basket with this design - love it. So many ways it can be used. 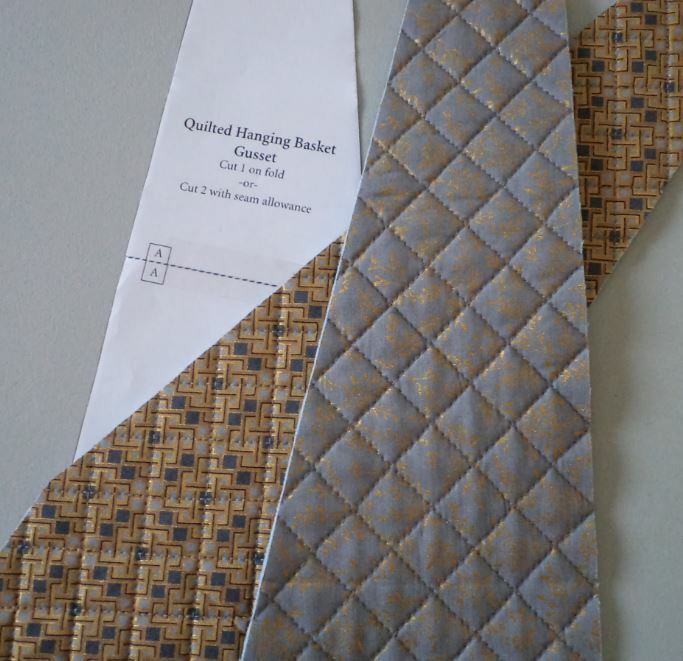 Much as you didn't enjoy the cross hatch quilting, it's very effective, and the lines are so straight.